Q. Can I take a tour of the Sterling Memorial Library stacks? Q: Can I take a tour of the Sterling Memorial Library stacks? About this time each year we give undergraduate students a chance to explore one of Yale's most iconic buildings: Sterling Memorial Library. These one-hour tours explore library study spaces and the book stacks – a 15-story tower that holds close to 4 million books. You will also learn about the building's history (hint: it's not as old as you might think). Library tours run from 9/24–10/16. 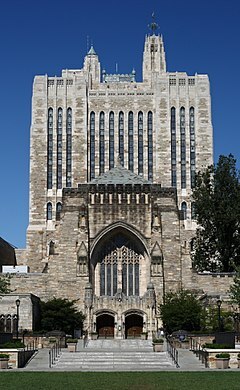 As former University Librarian, Frank Turner ’71, said, “When you think of the scholarship that has come out of research done in Yale’s libraries, you stand in awe.” He was right: Robert Fagles, Harold Bloom, Henry Louis Gates Jr., Umberto Eco, Judith Butler, David McCullough and countless others have all been through the Yale Library stacks. And now you will, too!